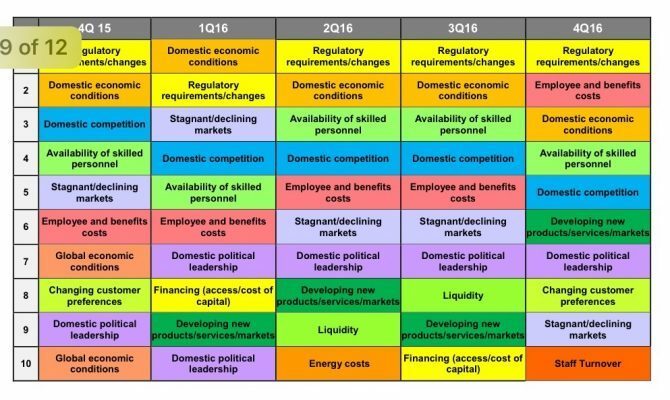 Keeping up with ongoing and ever-changing regulatory requirements remains the top challenge for CPAs in Business and Industry, and has held the top spot in the AICPA’s Quarterly Business & Economic Outlook survey for four of the past five calendar quarters. As the FASB talks about considering whether to slowdown standard-setting as we enter 2017, companies, auditors, audit committees, legal counsel, compliance executives and others across the business spectrum are engrossed in systems, accounting and internal control changes associated with new accounting standards for leases, revenue recognition and credit losses. Newly effective PCAOB standards for 2017 include disclosure of the name of the audit engagement partner, and the SEC reminded constituents of the need to focus on certain practice areas at the recent AICPA Conference on Current SEC and PCAOB Developments. The need to keep up with complex and changing regulations doesn’t stop with the accounting and auditing regulators; CPAs in Business and Industry are also tasked with analyzing and implementing changing regulations issued by the Internal Revenue Service, the Department of Labor (including the new overtime law, which a court in Texas has stayed pending further review). Funding, attracting and retaining qualified staff take up 3 of the top ten spots, highlighting the trend in the CPA and finance profession in particular, with a growing shortage of CPAs at the begining of the talent pipeline – as more students major in accounting, but decide not to sit for the CPA exam, and talent shortage issues at the more mature end of the spectrum, where CPAs transitioning from audit firms to mid-level or senior finance roles in business and industry so not always have the skillset in soft skills such as strategic planning, communication, and leadership skills, or in higher level finance skills. The AICPA has stepped in to expanding both ends of the funnel – increasing the number of CPAs entering the profession, and enhancing opportunities for CPAs transitioning to business and industry, by furthering its joint venture with the Chartered Institute of Management Accountants (CIMA), including a focus on core competencies for management accountants and through its This Way to CPA program and associated programs offered by the Center for Audit Quality, such as its Discover Audit, Auditor Proud, and Profession Proud campaigns. The MACPA and other state societies also sponsor programs directed at building the pipeline of new CPAs, such as the MACPA’s Young Professionals Council. Programming directed at virtual CFOs is also on the increase, as well as expanding programs in client accounting services. 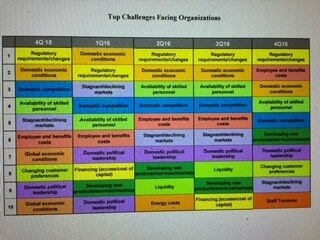 The remaining spots on the CPAs in Business and Industry’s ‘Top Challenges’ list included challenges relating the economy, competition and political leadership, with the balance of the list focusing on changing customer preferences, stagnating markets, and the need to develop new products/services. CPAs in Business and Industry seeking to anticipate key challenges, strengthen their resiliency and ability to leverage off opportunities presented by these challenges, can benefit from adopting the strategy that forms the backbone of The Anticipatory Organization- Finance and Accounting (AOAF) program. The AOAF program, created by leading futurist and F100 consultant Daniel Burrus, teaching accounting and finance professionals how to recognize hard trends and manage successfully to benefit from those trends. Ignore change at your peril, is the message many successful CPAs in audit, business and industry have adopted. For choosing deliberately, or by default, to ignore change, is to virtually guarantee your career, company or industry will be disrupted. The topics of technology, innovation and leadership were also in focus at the MACPA’s recent CPA Summit. The top 10 challenges identified in the AICPA’s Business and Industry survey are consistent with the hard trends identified by Burrus, which fall under three broad categories: Changing regulation, demographics, and technology. And these trends are contributing to exponential change in what we do and how we do it, raising the importance of considering why we do what we do. Learn more about the AOAF program at blionline.org/ao; contact The Business Learning Institute to discuss ways to customize the program for your firm, company or organization.